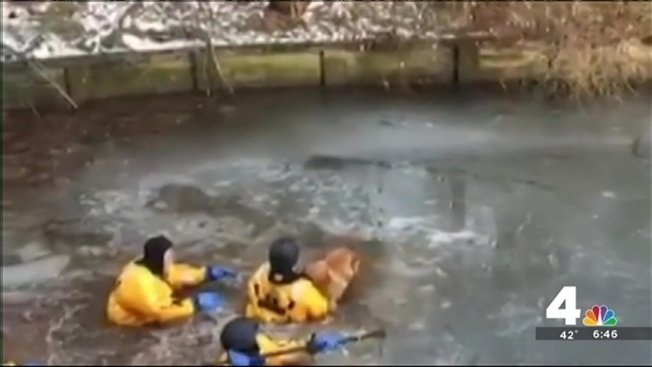 Fairfax County firefighters pulled a struggling, whimpering dog from slipping beneath the ice on a Reston lake Wednesday morning. The 75-pound chow named Angel fell through the ice on Lake Thoreau around 8:40 a.m.
Kristina Evans heard the dog as she got her child ready for school, the Northern Virginia Bureau's David Culver reported. "I heard the dog and I stopped and I said, 'That's a distress call,'" Evans said. She rushed to her porch and saw Angel struggling to climb back on the ice. Then she called 911. Firefighters arrived to find her struggling in vain to get out of the freezing water and howling in fear and discomfort. “When we arrived on scene, we had to go down a bank with snow on it, and the dog was about in the middle of the canal," said Rob Blesetti of Farifax County Fire and Rescue. "Angel, it's OK," a woman, presumably the dog's owner, can be heard saying on a video Fairfax County Fire and Rescue posted to Facebook. "We saw the dog was half in the water, half out, clinging to some ice, so we knew we had to get in there," said Joe Gangler of Fairfax County Fire and Rescue. Crew members got into ice commander suits and pulled Angel from the lake less than 10 minutes after they got the call for help, authorities said. Medics evaluated Angel on the scene. She wasn't hurt and was returned to her owner. About an hour before Angel's rescue a cocker spaniel named Tootsie was rescued from a pond in the 21400 Windmill Drive in neighboring Loudoun County, according to Loudoun County Fire-Rescue. Firefighters from Ashburn found Tootsie about 60 feet from shore. They put on the ice rescue suits and one went in the pond while the other waited on shore in case assistance from there was needed. The firefighters managed to get Tootsie to shore, but the firefighters suffered minor bite injuries in the process. Animal Control was called, but the person responsible for the dog showed up and took her.